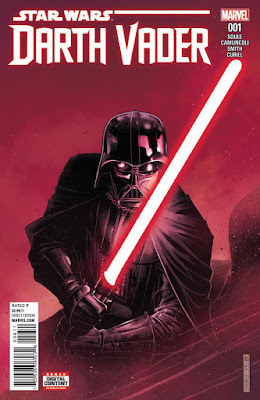 This week saw the release of the first issue in Marvel's new Star Wars: Darth Vader comic book series, written by Charles Soule with art by Giuseppe Camuncoli. Set immediately following the events of Revenge of the Sith, the series follows Vader on his first days in the suit as he constructs his red lightsaber. This is second ongoing comic book series from Marvel to star Darth Vader. The first Vader series ran for 25 issues from February 2015 to October 2016 and was set between A New Hope and The Empire Strikes Back. I'll be honest, I wasn't the biggest fan of the original Darth Vader series. I found it to be very hit or miss. Some elements, like the inner politics of the Empire post-Death Star and Vader discovering the truth about Luke being his son, were among the best stuff Marvel has produced since reacquiring the license in 2015, while other stuff, mainly Cylo and his creations, didn't work for me at all. All that to say, I wasn't that enthused with the idea of an another Vader comic from Marvel. However, by setting the series right after Revenge of the Sith, Soule does have a chance to explore what is, presumably, a very confusing time in Vader's life. In Revenge of the Sith it's made clear that Anakin knows what he is doing is wrong, he just can't see any way out of it. Arguably, he could have accepted help from Padme or even Obi-Wan to try and correct his mistakes but now those options are gone and Vader is pretty much locked in in his new role as Palpatine's enforcer. I'm curious to see how the series handles Vader in this era as it goes on. I've always thought that, between Episodes III and IV, Vader works best as a "boogie man" type of antagonist. This is because there is only so much evolution that can happen with Vader outside of the saga films. His character doesn't grow or change, he's just the unstoppable force the Emperor calls in when he needs something done right--like at the end of Rogue One. Does Vader still regret his fateful decision? I would argue, yes but he's forced to bury that regret if he wishes to continue living. 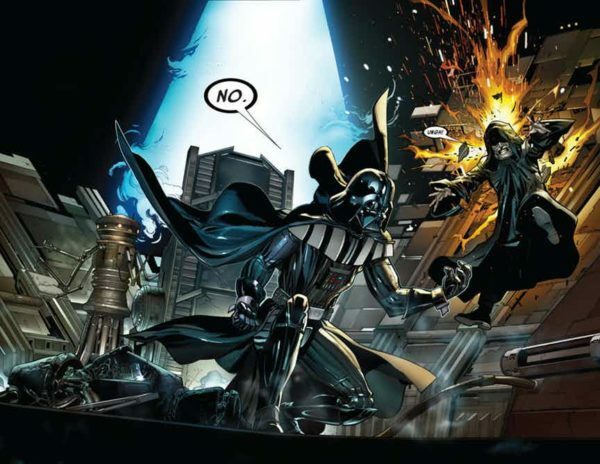 The comic makes this abundantly clear when, in a continuation of the infamous "NOOOOO" scene from Revenge of the Sith, Vader attacks Sidious in rage over the death of Padme. Sidious stops Vader's attack and uses his Force lightning to remind Vader of his superior mastery of the Dark Side. Vader turning on Sidious, albeit briefly, was hands down the best part of the issue. Considering Anakin's justification for turning to the Dark Side was his desire to save Padme, her death means he failed in his mission and has done all those terrible things for nothing. He's now without purpose and without direction, while also being under the thumb of the most evil being in the galaxy, which will ultimately lead to Vader burying his emotions and becoming Sidious' attack dog. Coming out of this issue, my major question for this is who will be the Jedi Vader takes the crystal from. You would think that, whoever they are, they would have some connection to Anakin Skywalker. This would allow us to explore deeper Vader's reaction to the events of Revenge of the Sith, perhaps even question his choices a little before fully swearing himself over to the Dark Side. The problem is the characters who would most likely be able to make Vader/Anakin question his decisions all seem to be off the table. He can't go after Obi-Wan for obvious reasons, and we saw in this issue that Yoda's lightsaber was incinerated on Coruscant with all the other Jedi lightsabers. The other clear option would be Ahsoka, but Star Wars Rebels makes it very clear that two have not seen each other since the Clone Wars. We know that other Jedi survived Order 66 but is there anyone left who could make Vader/Anakin question his choices? I expect that Soule and Marvel have something more planned that just Vader hunting down a Jedi we've never heard of before, taking their lightsaber crystal, and making his iconic saber. But it seems any turmoil within Vader will have to come from somewhere other than the identity of the crystal's original owner. Sidious puts an emphasis on "the gift of pain" in this issue, so maybe the process for "making the crystal bleed" will involve Vader having to face the memories he will one day bury. There are a couple of other interesting aspects of the series I want to acknowledge. One, was the panels where we actually see the world through Vader's eyes. It's a cool touch, as it was in Revenge of the Sith, that helps to dehumanize Vader (both for himself and the audience). The other thing that was interesting was Mas Amedda's speech on the steps of the former Jedi temple where the Jedi lightsabers were burned. It's a dramatic visual that shows just how far the public's perception of the Jedi has fallen. The Jedi were once seen as the heroes of the galaxy but, thanks to Palpatine's manipulation, now nobody seems to have any problems with their most iconic symbol, the lightsaber, being burned. In The Clone Wars animated series, we saw how Palpatine slowly turned the public against the Jedi and this felt like a fitting, if extreme, follow-up to that. While I wasn't blown away by the first issue, I'm intrigued to see where the series goes. The series has an intriguing premise, but the first issue doesn't have the chance to deliver on that potential. To be fair, it's hard to judge any comic book series based on the first issue, given that there is so much set up that needs to be done. Hopefully the next issue is able to start really delving into Vader's psyche at this moment in time.